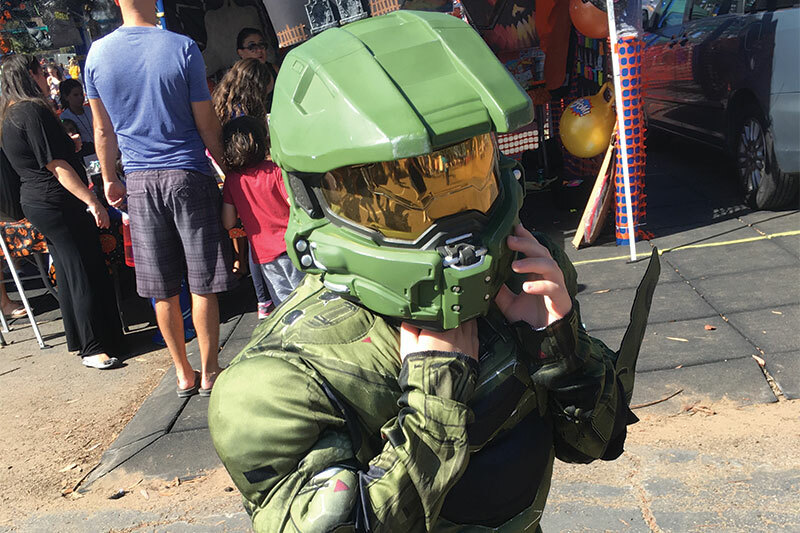 A young star trooper adjusts his helmet during last year’s Halloween Carnival at Miramar Ranch Elementary. A frightening festival is headed to Scripps Ranch in October. Miramar Ranch Elementary School is hosting its annual Halloween Carnival on Saturday, Oct. 20 from 11 a.m. to 4 p.m. The carnival is free to the public and will feature a haunted house, carnival games, a bake sale, cake walk, laser tag, food trucks, a book sale and, new this year, a dunk tank. Helena Parker, carnival co-chair, said there is fun to be had for all ages. “It's the perfect way to spend a Saturday in October celebrating Halloween. There's something fun for everyone in the family to enjoy,” Parker said. The carnival also features a pumpkin patch, hay rides and a petting zoo. Parker said the biggest draw to the carnival is typically the haunted house. The fifth grade class will serve as the actors and will work to create the entire haunted house experience. Children have the option of going through the haunted house with the lights on or with the lights off. There will be a special preview of the haunted house the night before the carnival, Oct. 19, from 6 to 8 p.m.
Scripps Ranch resident Rachelle Feretti said her entire family enjoyed attending the carnival last year. The carnival helps Miramar Ranch Elementary School raise needed funding for specialty programs at the school including art, music, science lab and the school garden. “Sponsors and attendees’ contributions help to bridge the gap between what the San Diego Unified School District can provide to our schools and what students need for a well-rounded education,” Parker said. Both children and adults are encouraged to come in costume as there is a costume contest. Also included during the carnival is a raffle with prizes ranging from tickets to Disneyland to an American Girl Doll and an electric scooter. Residents can buy pre-sale package tickets for a discount in advance of the carnival online at halloween.miramarranch.org or buy regularly priced tickets the day of the carnival. It should be noted that dogs or pets of any kind are not allowed at the carnival or on school grounds.